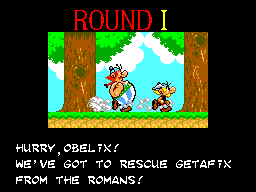 Getafix was kidnapped by the evil Roman Empire and made hostage of the fearsome Darth Caesar (lol). It´s up to Asterix, Obelix and Dogmatix to rescue him and keep their small village safe from the Romans, to do so, they must travel all over Europe facing the most difficult situations you can imagine!! Bonne Chance!! 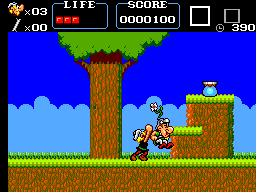 The game has an excellent gameplay, supported by an enormous variety in the levels and situations that the player must face. That makes the game challenging and at the same time interesting. Too bad there are no passwords. The graphics are really awesome (don´t forget this is a SMS), each level has it´s only personality and they are all extremely well done. Nevertheless, I must say that the 4th Round, especially the levels by night are the ones that stayed on my mind, really beautiful!! The sound it´s what you can expect from an SMS, nothing extraordinary. As to the music, that´s another department, it´s very good, even exquisite in some levels. Once more I must talk about the 4th round, whose music is still on my mind 13 years after finishing the game, Awesome!! There were no control options available and the fact is they were not needed, the game is ultra easy to handle and the controls are easy and well laid out, nothing like some crap we play today that requires hours of yoga and meditation in order to prevent the destruction of the console. To me the game as an excellent replay value, I must have finish it more than 50 times, the end is hilarious and respects the Asterix BD spirit. You will finish it more than once, I guarantee it! 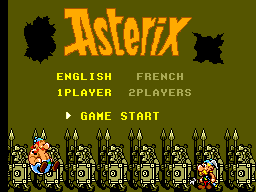 Asterix is an extraordinary platform game, that showcases the capabilities of the SMS very well. Good graphics, sound and gameplay, alongside a well balanced difficulty and replay value make this game my 6th favorite SMS game off all times!! ADVICE: BUY,BUY,BUY!! !